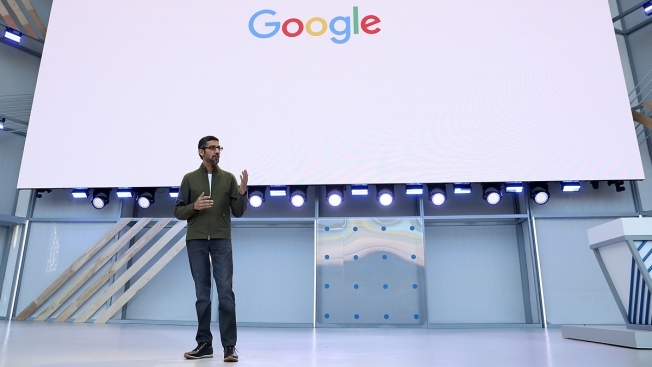 In this May 8, 2018, file photo, Google CEO Sundar Pichai delivers the keynote address at the Google I/O conference at Shoreline Amphitheater in Mountain View, California. Google's massive footprint is only getting bigger in 2019. CEO Sundar Pichai said in a blog post on Wednesday that the company is building new data centers and offices and expanding several key locations across the U.S., spending $13 billion this year. Pichai outlined the plans, which include opening new data centers in Nevada, Ohio, Texas and Nebraska, the first time the company will have infrastructure locations in those states. The company is also doubling its workforce in Virginia, providing greater access to Washington, D.C., with a new office and more data center space, and expanding its New York campus at Hudson Square. Google is showing its willingness to further open its wallet, following a year in which capital spending more than doubled to $25.46 billion. Far from its roots as an online advertising giant, Google is building out data centers to bolster its cloud-computing division as it tries to keep pace with Amazon Web Services and Microsoft. It's a business that requires providing fast and reliable computing access and resources to large corporations and government agencies. What investors need to know about Google's increased spending from CNBC. Data centers also serve Google's core search, Gmail and YouTube products. The company didn't say home much each location will cost or provide information on tax incentives from local communities. Ruth Porat, finance chief of Google parent Alphabet, said on the company's earnings call earlier this month that she expects the "capex growth rate in 2019 to moderate quite significantly." Pichai said the plans will likely create tens of thousands of construction jobs across Nebraska, Nevada, Ohio, Texas and Virginia, as well as Oklahoma and South Carolina, where the company is expanding existing data centers. Google didn't say how many new jobs the data centers and business offices would create. Pichai also said that the company is adding new office buildings in Texas and Massachusetts, building out more space in Illinois, Wisconsin, Washington state and Georgia and redeveloping California locations near Los Angeles and in the Bay Area, including the Westside Pavillion and Spruce Goose Hangar. Last week, the Austin-American Statesmen reported the company planned one new office tower in Austin, Texas, to add approximately 5,000 workers. In late 2018, the company announced it's $1 billion investment for a new campus in New York City, which it said will double the workforce there from 7,000 at the time.